Impacts from Florence will only continue to worsen in North and South Carolina as heavy rain and runoff continues. The local area can expect seasonable, average weather through the middle of next week. The Tropics: Hurricane Florence made landfall near Wrightsville Beach, North Carolina around 6:15am Friday morning. Deadly storm surge, destructive winds and torrential rain will continue through Friday. Water inundation forecasts account for a long duration east to west wind flow that will cause water to pile up as high 9 to 13 feet as the flow of the Neuse and Pamlico Rivers reverses. Many homes and business have already taken water and there are people that need to be rescued. There could be additional rainfall of 20 to 30 inches. Major river flooding is anticipated. 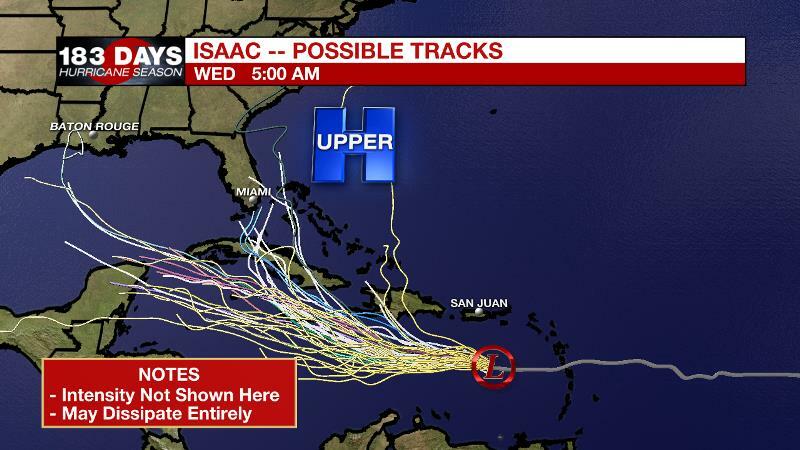 Elsewhere, a ragged Tropical Depression Isaac has moved into the eastern Caribbean Sea. While there are plenty of showers and thunderstorms associated with the system, shear has almost completely diminished the center. The system is likely to degenerate into an open wave over the coming days, and overnight forecast models have become less aggressive in redeveloping this system in the Gulf of Mexico. Still, it is too early to close the book on Isaac. There is no need to worry about the system for now, but check back in periodically over the coming days. Helene and Joyce are both tropical storms racing northeastward toward the Azores and will not bother the United States. The poorly organized area of showers and thunderstorms in the western Gulf of Mexico never materialized into a tropical system but the outcome would have been similar either way. There was never great concern for Louisiana, but south Texas can expect 3 to 5 inches of rain and some isolated flooding over the weekend. Today and Tonight: A similar forecast will shape up for Friday compared to Thursday. Early sunshine will allow highs into the low 90s before a few showers and thunderstorms pop in the afternoon. About 30 percent of the area should see rain. Overnight will be partly cloudy with lows in the mid 70s. Up Next: An upper level ridge west of Florence will bring a bit more stability to the atmosphere over the weekend. Only isolated showers and thunderstorms, 30 percent coverage, will be possible during the weekend afternoons. Less activity will allow thermometers to stride for 90 degrees again, which is getting to be above average for the time of year. Even drier and warmer conditions are anticipated into early next week as the area sits on the periphery of the remnants of Florence. Football Forecasts: High School football games will complete on a partly cloudy and sticky evening with temperatures falling out of the 80s into the upper 70s. 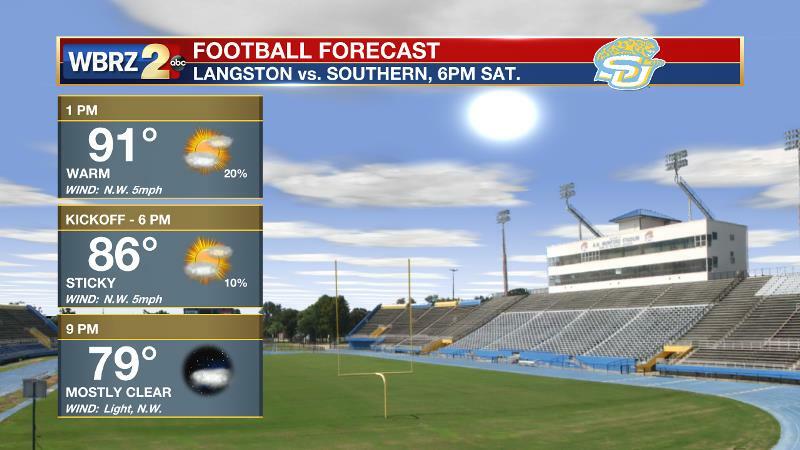 A stray shower could linger up until kickoff for one or two areas but the chance is low. Southern will open their home season with partly sunny and warm conditions on Saturday. As is typical for late summer, an isolated shower or thunderstorm is possible. 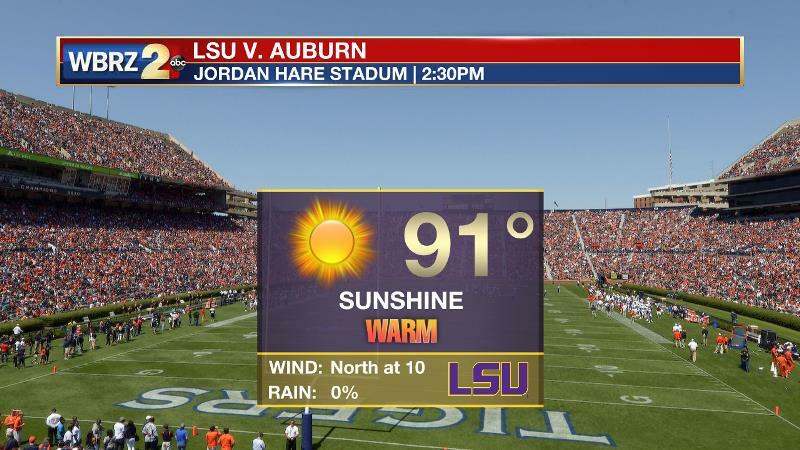 In Auburn, sun and heat are expected for the LSU game. As an inverted trough associated with a weak Gulf of Mexico disturbance pushes westward and into Texas, daytime heat will become the main driver for convection over the weekend. With some subsidence in the atmosphere due to a ridge on the western side of Florence, only isolated activity is expected. 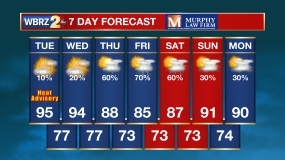 Higher pressure is likely to remain over the area well into next week resulting in hot and humid conditions with just a few pop-up showers and thunderstorms. It is a little too determine the fate of Isaac’s remains but there are some model solutions that suggest the wave could regenerate into a tropical system in the Gulf next week. This is not a majority idea from the forecast models but one that would warrant attention from our area, so stay in touch!